We are offering wide range of Pressure Plug. Our conveyors are highly demanded in the market for their accurate dimensions and durability which we provide in affordable prices. Characterized by black oxide surface treatment, the proposed series of pressure plugs is made of cast iron with cut threads and protruding square drive. Highly working Pressure Plugs is provided by us to customers. The offer Pressure Plugs are extensively used in a pipe smaller than the maximum rated inflation diameter. Further, our products are of standard quality and have longer life. One can avail these products as per their needs and requirements. Our clients can avail from us, a wide range of pressure plugs.These plugs are appreciated for their high tensile strength and corrosion & abrasion resistance. Further, we offer customization in our products as per the specifications and requirements of our clients in sync with the manufacturers. 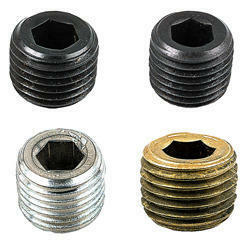 With the help of our skillful professionals, we are engaged in trading and supplying a Pressure Hex Plug. We are a leading distributor wide range of Pressure Plugs. 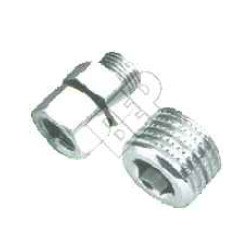 These plugs are appreciated for their high tensile strength and corrosion & abrasion resistance. Further, we offer customization in our products as per the specifications and requirements of our clients in sync with the manufacturers. DME Metric Brass Pressure Plugs are available in four popular BSPT diameters as well as an M10 x 1 offering.